This listing is from Mylittlewoodshop for 3 unfinished wooden shapes. This package contains a quantity of 3. 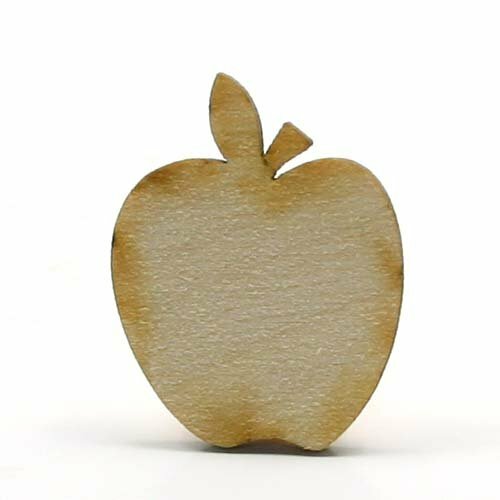 NOTE: These apple unfinished wood are cut with a laser cutter and the sides have a slightly darkened edge due to the laser beam cutting. The laser beam creates a nice smooth finish on the side of the rectangle. The craftsmanship and quality of the unfinished wood turnings are fabulous. Unfinished wood can be so versatile. You can leave it natural or unfinished, stain, apply a wash, decoupage, use color pencils, sharpie or marker, watercolor, stamp on it, paint with acrylic, metallic, pearl finish. You can even dye the wood. Laser Cut Wooden Shape and are manufactured by Mylittlewoodshop2. Slightly Darkened Edges from laser beam cutting with the laser cuting creating a nice smooth cut edge. If you have any questions about this product by Unique Wood Shapes, contact us by completing and submitting the form below. If you are looking for a specif part number, please include it with your message.